When did you decide that VFX was the job for you? What inspired you to follow that route (e.g. was there a movie that stuck in your mind)? Well, ever since I was a kid I always loved to build and paint dioramas – only to burn them or blow them up somehow later on! At the end of my studies, I didn’t work in movies at all but instead went into creating motion graphics with a bunch of good friends. As well as motion graphics, we’d tackle anything digital that we could get our hands on. That’s the way things were for several years, and because there wasn’t any actual VFX companies where I was, it never really crossed my mind to pursue it. I was already a bit tired of sitting in front of a computer all day doing a game gig when I received an email that looked like spam – a job offer from Lucasfilm. Turned out that it wasn’t spam! So that really came out of nowhere. Naturally, I took the job! How did you get started in the VFX industry? Lucasfilm was building a new department in their Singapore division. It was called DAG (Digital Artist Group) and it was pretty much an extension of Industrial Light and Magic. At first, we were just six people from different backgrounds and with different experience (I didn’t even know English at the time!) and my first task in VFX was to create some environments for a chase sequence in the first Transformers movie. So, just like that, I became a DMP Artist (Digital Matte Painter). I owe this amazing profession to two people mostly – Jonathan Harb who was the guy who found me online, and Joshua Ong who was the guy who “decided” I was going to be a matte painter. The rest is history, as they say. If you can pick, what would you say your favourite projects have been? There are many favorites. I would say The Spiderwick Chronicles, StarTrek I, Rise of the Planet of the Apes and Guardians of Ga’Hoole bring the fondest memories of learning a lot while being surrounded by great people. I wasn’t too happy with what I was using at the time, so I went looking for an alternative and that’s how I stumbled across Corona. It was in Alpha at the time, I think version A5. All I remember is a render of some aspirins in a box [Editor’s note – this was an image made by Ondra, and can still be seen here] and some simple website – my memory is pretty foggy on that as I was doing serious overtime in those days. What I do remember was that it was love at first sight, that I can tell you for sure! What has Corona Renderer let you do (or do easier and faster) compared to other render engines? I would say that what made it different was its capacity to chew through a lot without a hiccup at high resolutions; the speed of setting up something that looks great thanks to its perfect integration with Max; but mostly it was a particular quality to the renders that I can’t really define, some sort of creamy awesome looking outputs (I know that doesn’t sound like it makes sense, but I swear by it). I found it particularly useful and superior for scenes with trees and plants. I would create some proxies, scatter them, and fire away with complete certainty that I wasn’t going to have a crash or get some unpredictable results. What films have you used Corona Renderer on? I started using Corona while working on The Hobbit trilogy. It became my tool of choice for pre-rendering matte painting elements, like big landscapes or trees. We later used it extensively in Dawn of the Planet of the Apes for creating the apes’ forest city environments. Since then, I have had the chance to use it in several films like Godzilla, Star Trek Beyond and Science Fiction Volume One: The Osiris Child, plus in some commercials and a documentary. What is your workflow when using Corona? Because what I do most is environment work, I generally focus on rendering single images or individual elements at high resolutions which I later use as a base for creating a matte painting set extension and for projections setups in Nuke. For example, during Dawn of the Planet of the Apes, we had to deliver a group of Nuke setups that the Comp department could use for several dozen shots in a flexible way. I would build a 3D scene first with lots of trees and plants, then render these as groups (pretty much slicing the scene geometry based on the sequence cameras) which I could later layer back in Nuke as projections onto a version with lower resolution geometry. I would then keep dressing this “diorama” with extra plants, trees or fog elements. In that way we could easily make changes or fixes by re-rendering something in Corona, tweaking individual layers in Photoshop, or moving stuff around in Nuke. What kind of hardware do you use in your work? Nothing fancy really. Currently I’m using a single processor machine with 32 GB of RAM and a GTX video card. Of course I had better machines while working in big studios, but with Corona I don’t feel it makes too much of a difference – at least when displacement is used conservatively in high resolution images. Any upcoming projects you are free to mention that you will be using Corona Renderer on? I’m currently working on a Bollywood action flick with lots of urban environments and lots of destruction, adding up to hundreds of shots. It will be the first time I have used Corona to render full image sequences and integrate them with FX renders out of other packages. I’m also slowly advancing with my own project, a collection of illustrations about pre-Columbian Mayan society that will eventually become a book. What features would you like to see added to Corona Renderer specifically for the VFX industry? Open VDB of course would be great, and I see that is on the roadmap for Corona Renderer 1.7, among an amazing list of other things very focused on VFX work (thanks for that guys!) so that will be interesting. For me personally, one single feature that I’d love is EXR 2.0 support. With EXR 2.0 support, it would get much easier to integrate Corona into the always-complex VFX pipelines. And that’s it really, for big changes that would make Corona a more solid tool for VFX work. Also important would be little things that help on package integration, data portability, assets management, and better diagnostic options beyond a material override. Do you create 3D purely for fun still? Absolutely! It’s just that now I justify it by calling it a “personal”project so my wife doesn’t divorce me! What are your other hobbies outside of 3D? I do photography when I can, but I’m building my house right now here in the Yucatan Peninsula so I’m mostly busy doing carpentry, which fortunately I love as well. Though this time I will avoid blowing up the finished project! What advice would you give to someone thinking of starting in the VFX industry today? Nowadays younger artists get into a VFX company straight out of VFX school. I actually find that very damaging for their careers, and I would advise them to explore the world and refine their craft beyond their comfort zone before settling in to a particular role. There’s nothing worse than being pigeonholed and getting calcified early into a particular way of working, or even worse to become a “company guy” – ughh! I think people should always try to mature professionally, and place value on experience and knowledge over anything else. There are no shortcuts to that. 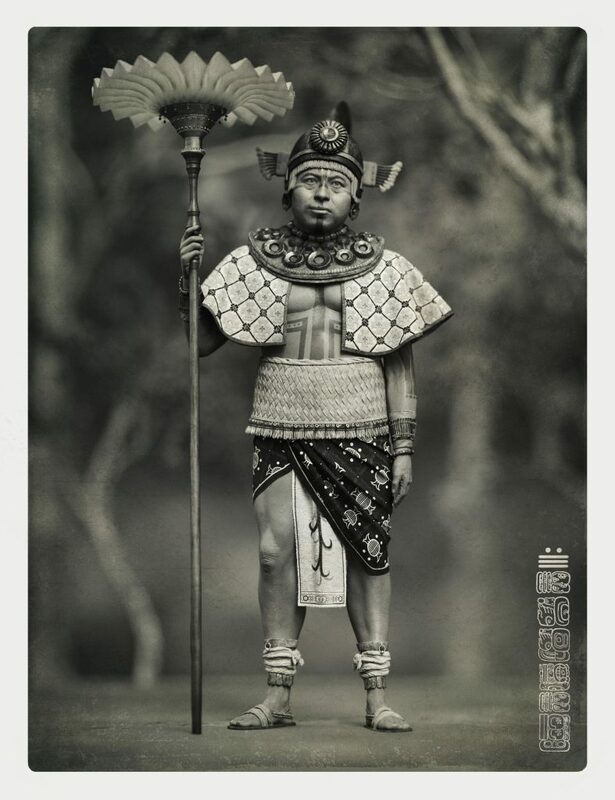 Besides the book of the pre-Columbian Maya, I was hoping to find the time to work beyond Hollywood, particularly in projects closer to my heart like Russian or Latin American films.